16 Channels of Elite Audio Conversion, HEXA Core Processing and Surround Sound Monitoring. The flagship Apollo x16 allows music producers, project, and post-production studios to track, overdub, and mix with new world-beating A/D and D/A conversion, HEXA Core UAD plug-in processing, and 7.1 surround sound monitoring* — all in a sleek single rackmount Thunderbolt 3 audio interface for Mac or PC. With thousands of chart-topping songs and hundreds of Grammy-winning albums under their belt, Apollo interfaces are no strangers to tracking stellar-sounding records. To improve on the previous generation Apollo interface’s class-leading audio conversion, UA engineers obsessively auditioned the latest A/D and D/A converters — ultimately pairing elite-class 24-bit/192 kHz converters with all-new analog circuitry for an ultra-pristine signal path. With 133 dB dynamic range and THD+N of -129 dB, the Apollo x16’s open, natural sound quality bests every interface in its class — regardless of price — and is the perfect starting point for applying UAD processing. 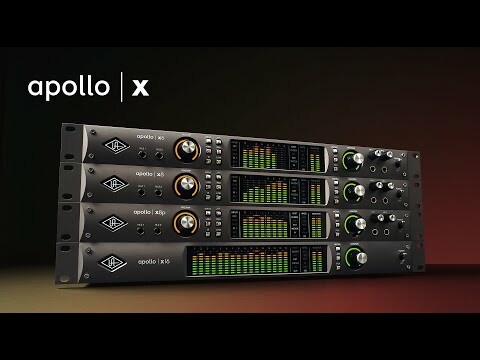 Going beyond the included Realtime Analog Classics Plus plug-ins, Apollo x16 lets you tap into the full UAD Powered Plug-In library of name-brand vintage EQs, compressors, reverbs, tape machines, channel strips, and more — at near-zero latency, regardless of your audio software’s buffer size and without taxing your computer’s CPU. • Free, industry-leading technical support — on the phone and online — from knowledgeable audio engineers *Surround Sound Support for Apollo X Coming Q4 2018. **Apollo x16 includes the “Realtime Analog Classics Plus” UAD plug-in bundle. Other UAD plug-ins sold separately at www.uaudio.com. All trademarks are property of their respective owners.